Don’t suffer with a cold, flu or other urgent medical issue without proper medical care! We offer prompt, high quality care for medical issues that are not life-threatening, but can’t wait for a scheduled doctor’s visit. We understand that life is hectic and stressful. That’s why we make every effort to accommodate your schedule for walk-in service. For life-threatening medical emergencies, contact 9-1-1 immediately, or visit the nearest emergency room. While we provide a wide-range or urgent care services, chest pain, uncontrolled bleeding, head injuries, and other severe, life-threatening conditions require the attention of emergency room medical staff. It’s impossible to anticipate the need for urgent care, which is why it’s important to know that you can rely on quick, professional care that won’t keep you waiting. With our on-site labs, EKG equipment, and highly trained physicians, you can have peace of mind knowing we’ll provide you with an accurate diagnosis and effective treatment plan, without having to wait. 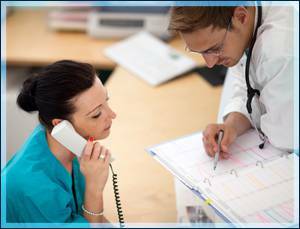 We work closely with Crittenton Hospital, as well as a the areas leading medical specialists, in order to provide quick and convenient physician referrals in the event that any patient requires services beyond what we are able to provide.